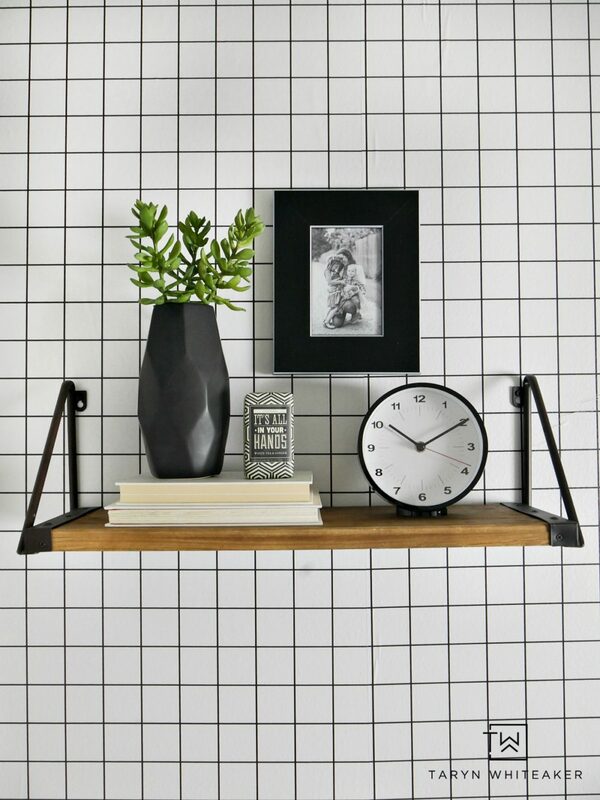 Disclosure: This room makeover is sponsored by Walls Need Love. All opinions and product selections are my own! So we have this bathroom that desperately needed a facelift. 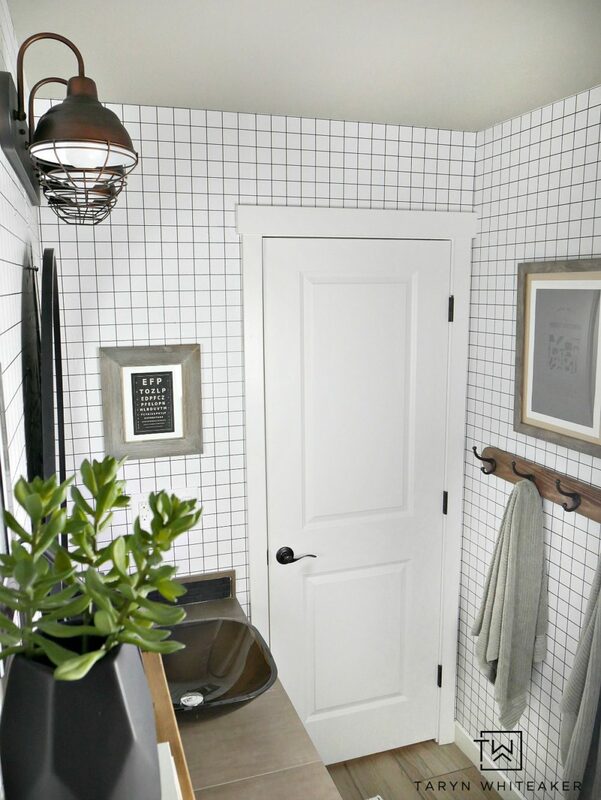 It’s a little bit of a different bathroom because it is accessible from both my 2 year old boy’s room AND the hallway. So the design needs to be suitable for both. Right now, we use it more for a guest bathroom for our upstairs but I know as my son gets older he will start using this bathroom for himself too. 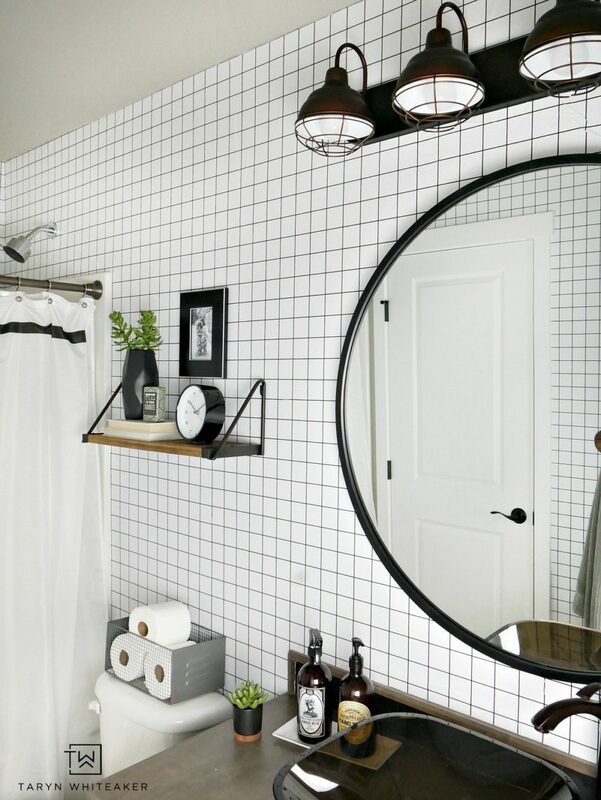 I had already started a very subtle industrial modern look in here, so I started with what I had and took it one step further to create this Black and White Geometric Bathroom. The biggest change to the space are the walls! 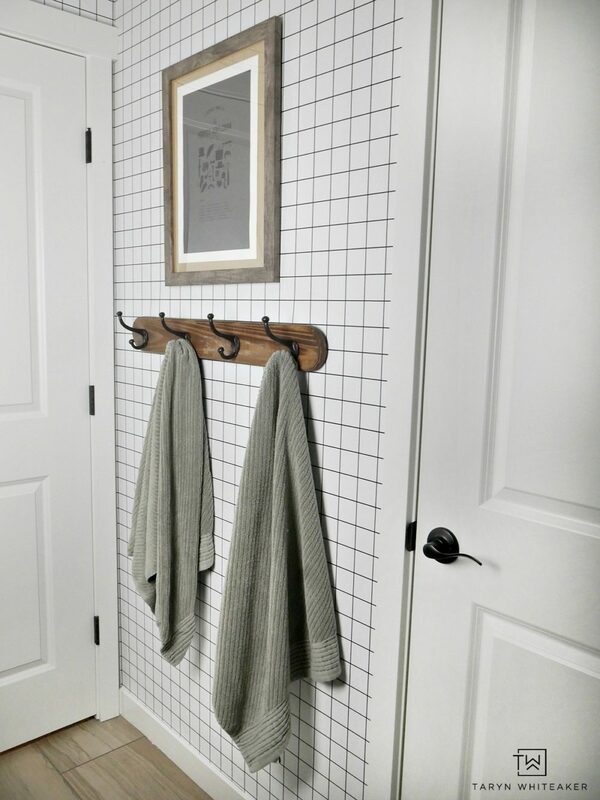 I am so into the grid pattern trend happening right now and I thought this would be the perfect way to completely change this space. I found this removable Grid Wallpaper from Walls Need Love and I was hooked. I loved how our master bedroom turned out with their Faux White Washed Brick Wall Mural, so I was read to tackle my next project. I really love the final outcome, but it didn’t come without hard work! I will admit that doing this wallpaper in a smaller bathroom was quite a bit more difficult than doing the large wall mural in our bedroom. I think the hardest part was working with such an intricate pattern that you had to keep straight. The problem for me ended up being our ceilings. I discovered that they are very slanted but I didn’t want slant the pattern at the top of the ceiling, so that resulted in a big of a trickle effect and some areas are not so perfect. All this to say, I am really glad I did it, I LOVE the pattern but the installation did take some time and patience! Here is what the bare bones bathroom looked like when we moved in (ok there were electrical covers, I already took those off). 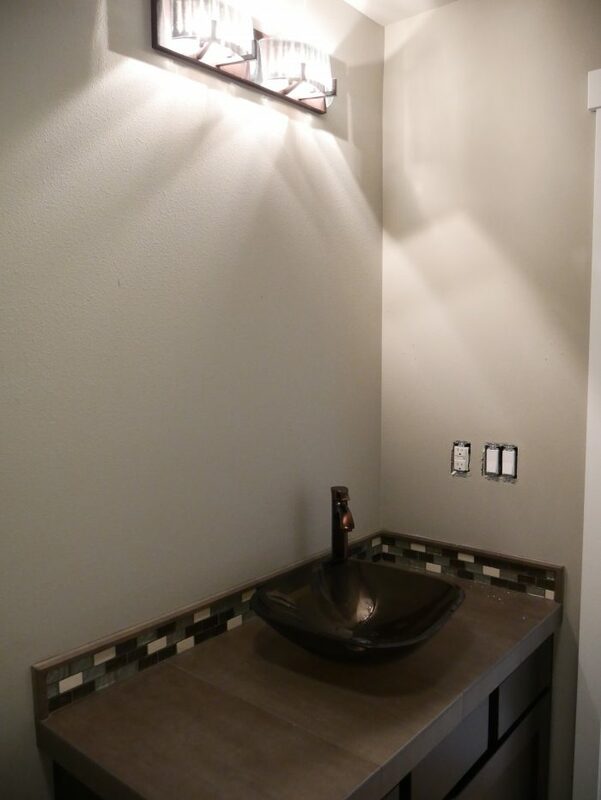 The light fixture was wayyyyyy too tiny for this bathroom. It gave off hardly any light, that combined with the dark fixtures made the bathroom feel so so dark and dim. And not my style at all. You guys, I seriously can’t believe this transformation! 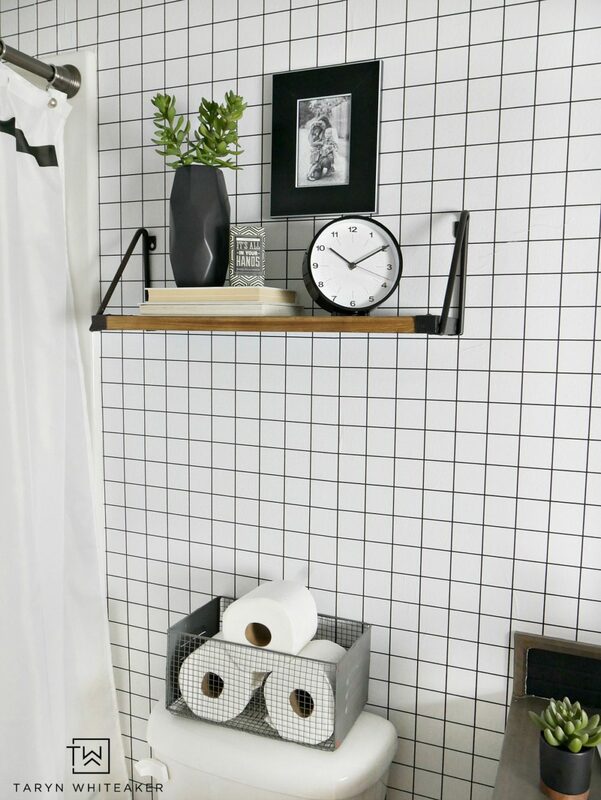 The new wall paper instantly changed the look and feel of this bathroom and the other decor changes were super simple and inexpensive. 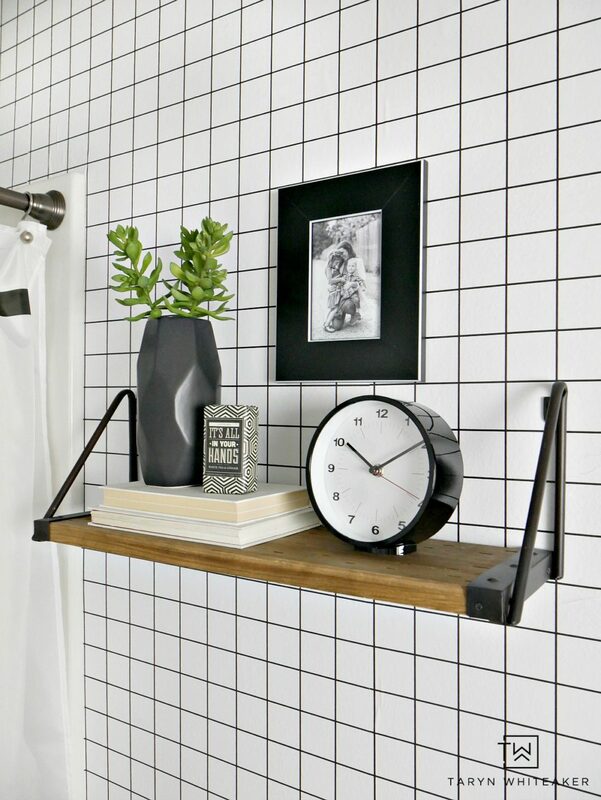 And can we talk about bathroom accessories for a second? If I’m being honest, I buy almost everything because of the label ha! 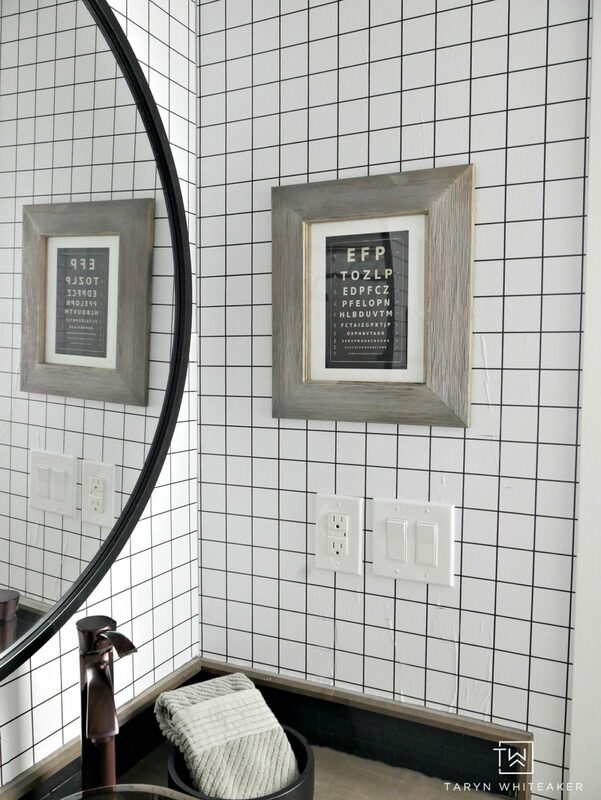 I found these and fell in love with the cool vintage masculine labels and had to have them for this bathroom. You may notice that the backsplash is different too! 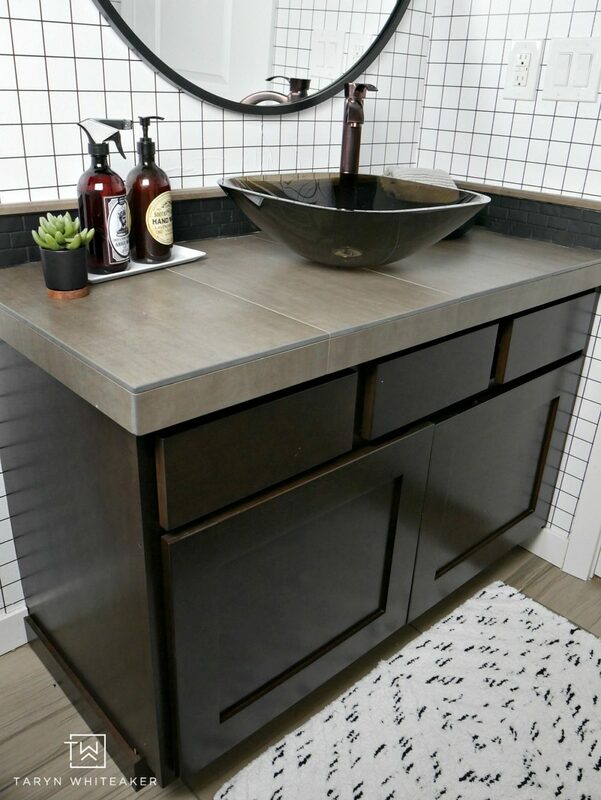 Well, I’m personally not a fan of mosaic tiles, I never liked the color of the ones that were in there plus they didn’t go with the look of the new design. So I painted them! I found a few really great tutorials and I love how it turned out. 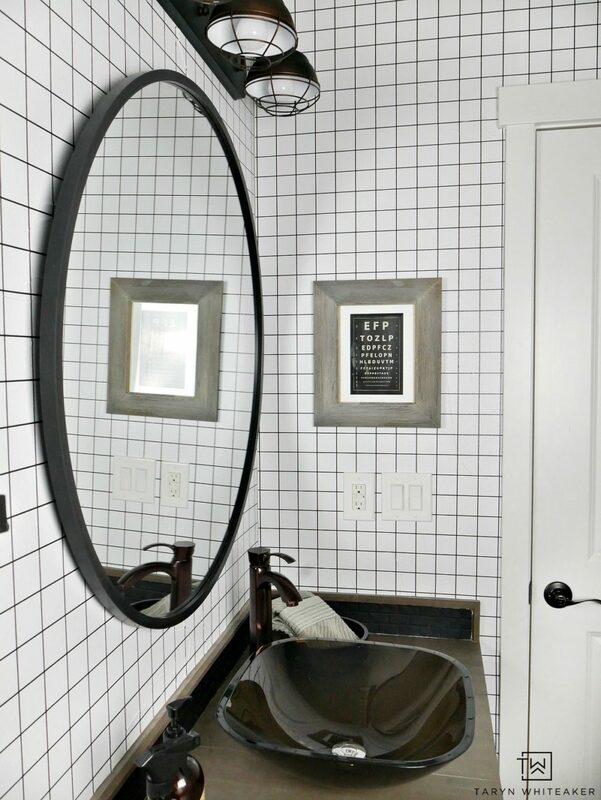 It really transformed the look of the vanity. I still might put a white vessel sink in here, but I’m actually happier with how this sinks looks now with the brighter walls than I did before. 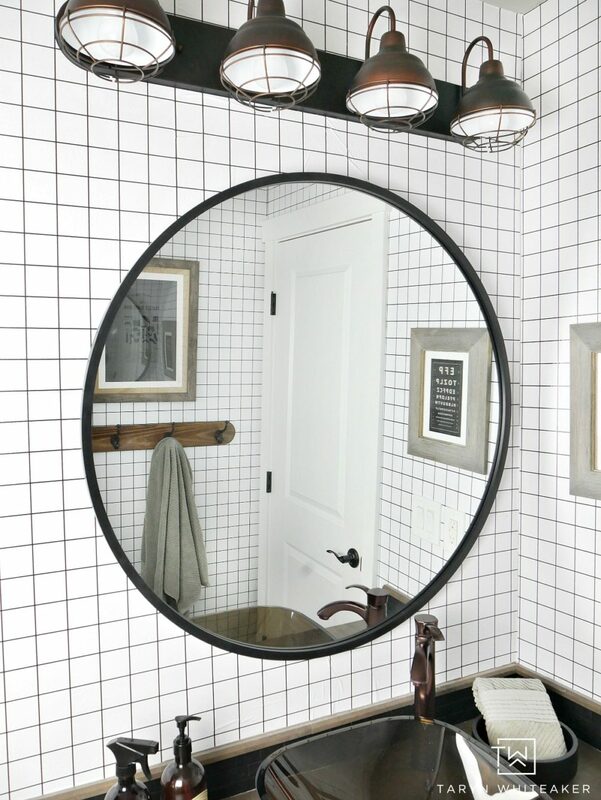 The grid paper really gave this bathroom the bold look I was going for. It is clean, simple but adds such a pop and modern vibe. 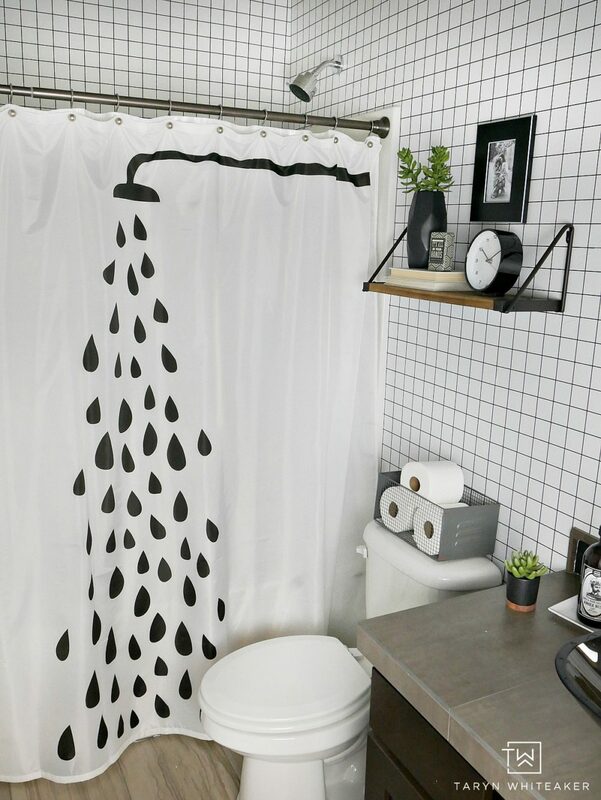 I paired the geometric wall paper with a tyopography style shower curtain. I thought it was fun and also modern. I really debated on how many shelves to put in this area. I ended up going with one indsutrial modern style shelf for a really clean look. Here is a look at this full side of the bathroom. It is a small bathroom with two doors, so it was hard to get it all into one shot! For me, this room was all about creating the perfect blend between a modern geometric print and rustic modern accents. Can I tell you a secret? I bought this light fixture almost three years ago, not too long after we moved into the house because I knew that the previous one was too small for this space and just not my style. Ummmm I just put it up! Gah! It only took me 30 minutes to switch out and I wonder why it took me so long to do it! I love the new look it gives this space. On a side note, I am pretty impressed that I still like it after this long because I tend to switch things out so often! I really debated on this rug. 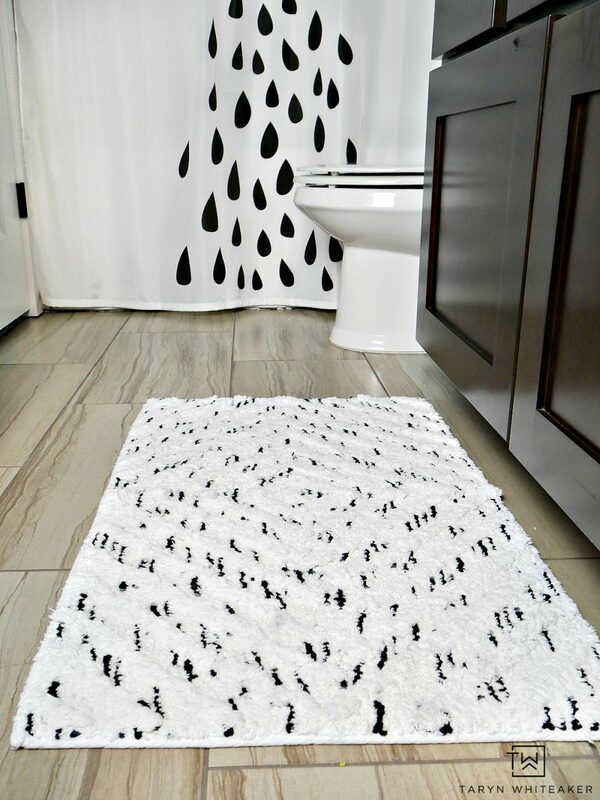 I love it, but I questioned whether it would be too much black and white pattern. However, I think it adds so much texture and I’m glad I kept it! In almost any space I do, I always had foliage. I think it adds pops of colors and a breath of life, sorta. 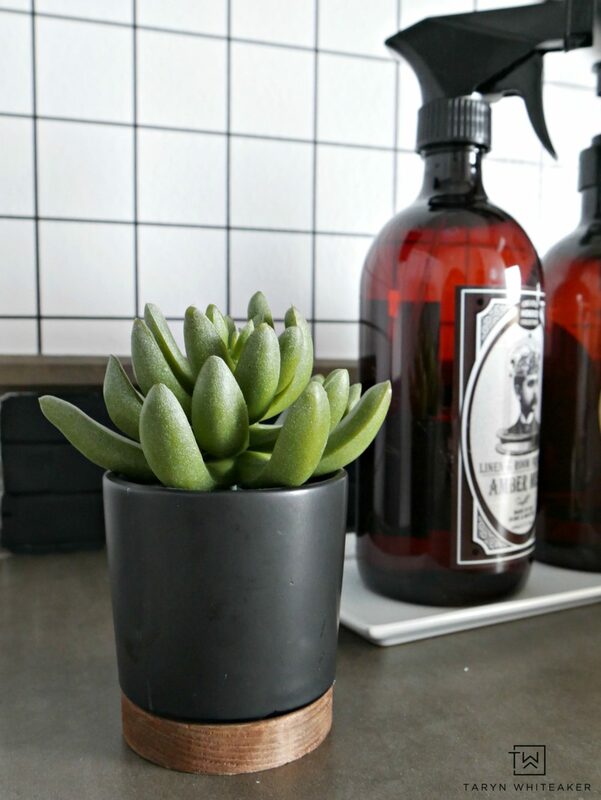 I once had a reader email me asking why I would put plants in a room that has zero natural light and I have two words: faux plants. 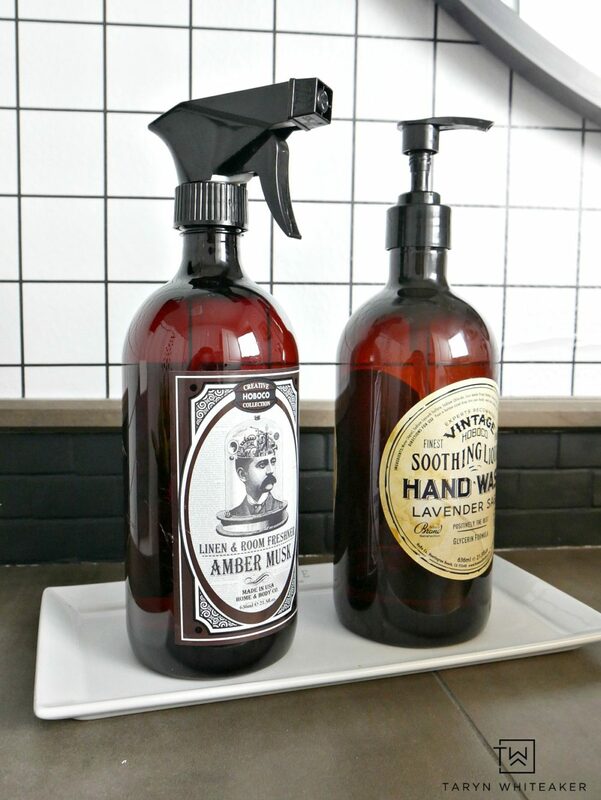 I use them throughout my whole house, you just have to find really great quality ones! 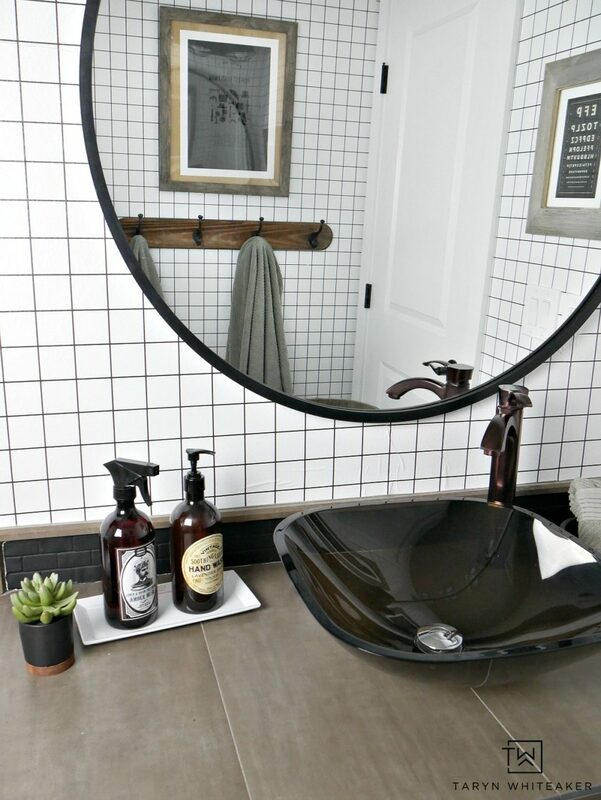 I couldn’t be happier with how this bathroom turned out. It’s been three years in the making and I’m so glad to have it done! 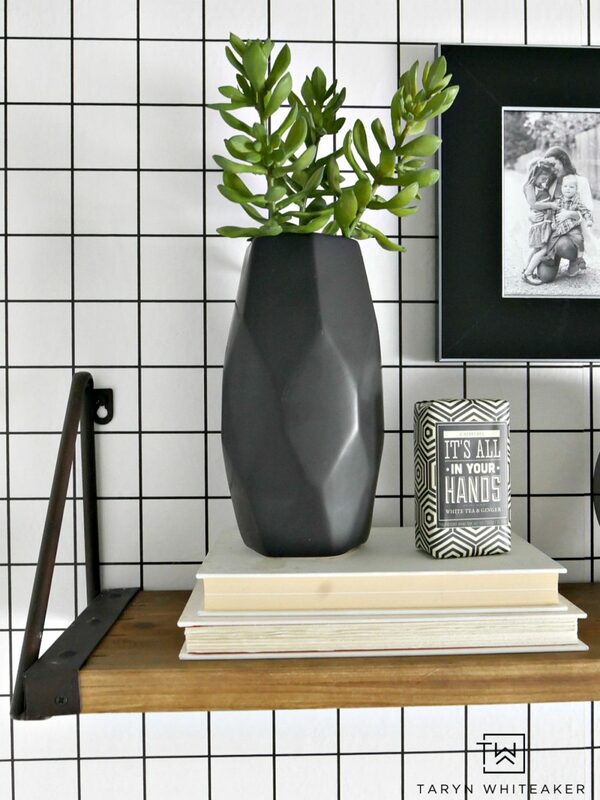 If you are thinking about adding a bold wall to your space, be sure to look through the Walls Need Love site, they have TONS of awesome patterns and murals and the best part is they are removable! Take advantage of the discount code above! What a transformation! 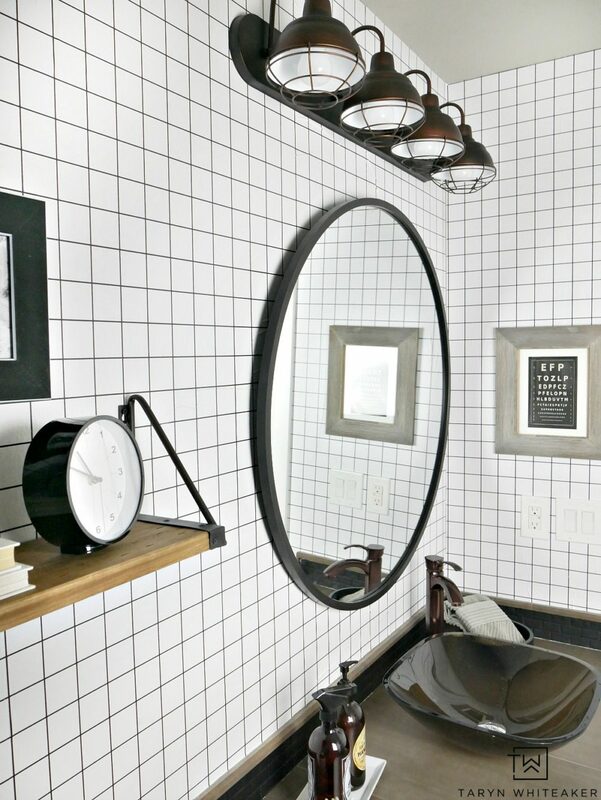 At one glance you realize that’s your (bathroom) accessoriess style you know what I mean?! And I LOVE your light fixtures and the vintage labels, too. Please tell me where did you get them?? 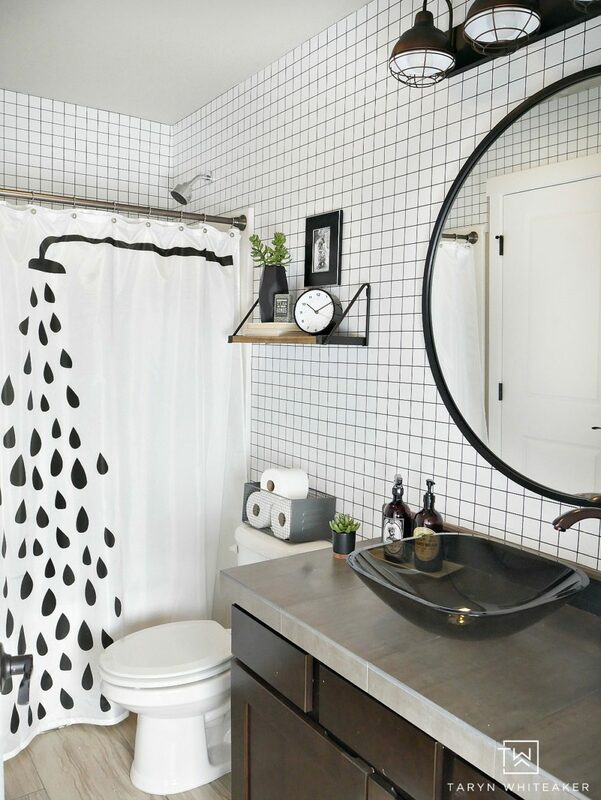 I absolutely, love everything about this bathroom! Great job! Looks wonderful! Very different and unique……and perfect!! Taryn, I have just one word ‘WOW’. 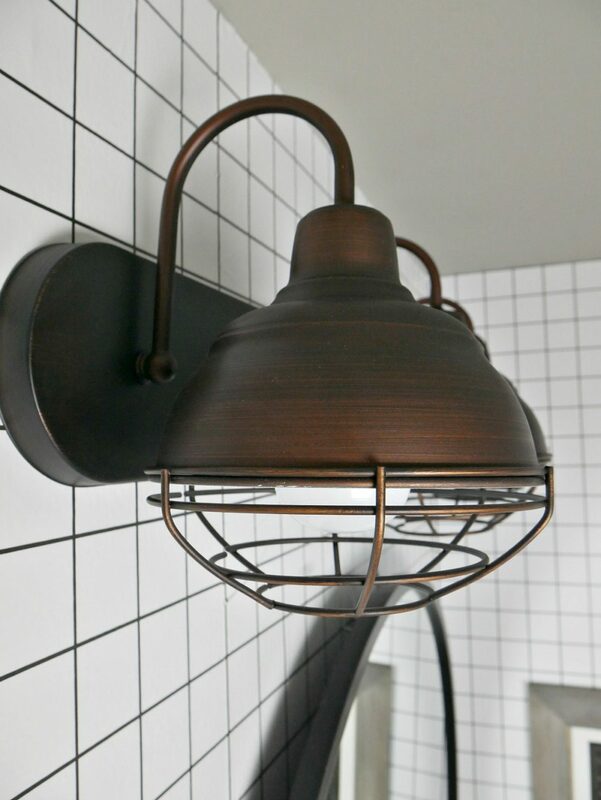 The transformation the removable grid wallpaper has made is just amazing and paired with your industrial masculine fixtures and decor, it looks really stunning! Great job, it’s absolutely beautiful. How are you finding WNL wallpaper is holding up in the bathroom? Is it staying put? Yes it is! I haven’t had any issues with it peeling off. LOVE it all! Please give us a list of places to buy all your great accessories!